The Network has been active, since then. It’s a new face of Africa, no doubt. The helpless, hopeless continent determined to send a strong message regarding the agency of those who call it home. I think that somehow, the Oxfams of this world get so carried away by the salvation they bring to the helpless peoples of Africa, that they lose sight of the concept of African agency. Once you realise this you understand why Oxfam appears trapped in that irritatingly paternalistic mode of thinking. Saving Africa’s starving children (by providing food) and saving Africa’s saddening image (by providing images of epic landscapes) have this in common is this: they both rely largely on an obliteration of a sense of African agency. And herein lies my argument: what is required for Oxfam is for it to first of all acknowledge the agency of African governments and individuals (acknowledging is the all-important prelude to employing international pressure to nudge these governments into becoming more responsible). Without this acknowledgement, the embarrassing campaigns will continue. The idea behind that the African Grantmaking Network is obviously for Africans themselves to take charge of the do-gooding around the continent – a venture that has typically been left in the hands of outsiders. From Biafra to Ethiopia to Darfur to Congo. Oxfam needs to hear this: the money required to ‘save’ Africa is available, right here, right now, on the continent. We only need to find innovative ways to locate that wealth, and tap into it. There are pockets of substantial African goodwill to be drilled into with the same enthusiasm with which the continents oil-wells are being drilled. My suspicion is that African monies — whether stolen or earned legitimately – now have greater reason to stay behind on the continent and do interesting things. Unlike the days when the only viable option was the Swiss banking industry. Pan-African businesses are emerging in a manner that was unimaginable a decade and half ago. Nigeria’s UBA now has branches in 19 African countries. Nigeria’s Oando Plc is now quoted on the Johannesburg and Toronto Stock Exchanges. And Africa’s richest man, Aliko Dangote is currently expanding operations to almost a dozen African countries. Mobile phone company Globacom has pushed out from Nigeria into Benin and Ghana, and is preparing to launch in Cote d’Ivoire. Africa’s richest persons and biggest businesses are extending their spheres of influence beyond their home countries - South Africa invading Nigeria, Nigeria invading everywhere else. Much of that influence is of course currently commercial – business interests taking root in new markets, creating more wealth – but there’s no doubt that the philanthropic impulse is not far behind. Three years ago Theophilus Danjuma, a retired Nigerian Army General, decided to put $100m of his money (reportedly part of the proceeds from the sale of an oil block) into a brand new charity, the TY Danjuma Foundation. Dangote, who already spends millions of dollars annually within — and outside — Nigeria on everything from women empowerment to flood relief to polio eradication and job creation will no doubt soon start extending his corporate social responsibility to all of those countries in which he operates (if he hasn’t already). Tony Elumelu is passionately pushing the gospel of Africapitalism. His foundation is combining investment and philanthropy in the lives of smallholder farmers in far-away Tanzania. The Nigerian woman touted as the world’s richest black woman, Folorunsho Alakija, has got her own foundation. Here’s my idea: How hard can it be to convince these billionaires, and others like them across the continent, to extend their charitable giving in a manner similar to the way their business ambitions are expanding? Businessman Mo Ibrahim annually offers $5 million (payable over ten years) to African leaders who demonstrate statesmanship. Thrice in the six years since the award was launched no one has been found worthy. That’s $15 million available to be put to other uses, for the good of the continent. This is where the Oxfams of this world could consider stepping in. Instead of focusing its energy on selling images of starving children (which are apparently supposed to be necessary for convincing Western citizens), and instead of burdening itself with the task of selling landscapes as atonement for decades of selling suffering), perhaps Oxfam might be more useful building partnerships and alliances with these African billionaires, with the aim of helping them use their money to bring change across the continent. So, instead of obsessing itself with what Brits think of Africa, Oxfam should use its considerable clout (and there’s no doubting the fact that Oxfam’s decades of working on the ground in trouble-ridden spots gives it experience and clout which may be unavailable to local operators) to connect these businessmen with the challenges that require their wealth. My most recent job was with the British Council in Nigeria, and I know how influential British organisations can be on the continent — in terms of gaining access to the people that matter, in terms of goodwill capital. I doubt that Aliko Dangote would need a lot of convincing to donate relief materials to Darfur, or Somalia. Not when the Dangote Foundation already has experience donating to flood victims in Pakistan and explosion victims in the Congo. You can be sure that Mr. Dangote does not need to shocked into giving with images of suffering lives or stunning landscapes. And, come to think of it, donating to philanthropic causes in South Sudan might actually make it easier for him to get a foothold when he decides that the country needs a Dangote cement factory. There should be no shame whatsoever in mixing capitalist and philanthropic ambitions. The West has been doing that forever, no? So that’s my challenge to Oxfam. Forget about the images. Drop the corel-drawn pretensions. Forget about those British-public-perceptions-of-Africa that alarm you. Spare the weary Brits, thank them for all their help thus far (and I wholeheartedly acknowledge the generosity of the British public) and let them save their pennies and pounds. A struggling Britain too needs all the help it can get. The energy spent hounding Brits to donate should be spent instead sweet-talking Africa’s billionaires into building philanthropic empires. The continent desperately awaits its own Rockefellers and MacArthurs and Gates. 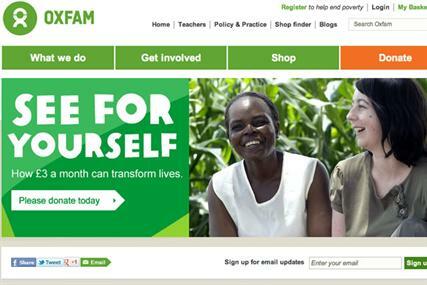 So, dear Oxfam, reach out to Africa’s richest men and women. Seek to build partnerships with them. Sell yourselves as the experienced-players-in-trouble-situations that you are. Everyone will be happy. You’ll get your work done, they’ll get the satisfaction that comes from doing good with their considerable wealth. And expanding their influence across a continent that offers the considerable business opportunity everywhere they turn. And, now that I think about it again, it is not only Africa’s billionaires who can make a difference! Late last year a friend of mine launched a crowd-funding site in Nigeria. It is based on the belief that Nigerians, like other Africans, are never too oxfamished to give generously.